Best noise-cancelling headphones to buy in 2015 | What Hi-Fi? Noise-cancelling headphones are a great way to enjoy your music on the move while also eliminating outside ambient noise, and ideal for use on trains, planes, offices, or in any other noisy environment. We've rounded-up the best noise-cancelling headphones on the market in 2015 from all of our reviews, from surprisingly cheap models to high-end premium cans – there's something for everyone, whatever your budget. The headphones market has exploded in recent years, driven by the rise and rise of smartphones (and tablets) as portable music and movie players. But it's no good having the best smartphone on your way to work if you can't hear your music. Noise-cancelling headphones might be your answer. How much? The affordable price and the unfamiliar brand name may be off-putting but there's no arguing with the value here. The noise-cancelling in these headphones does introduce a little hiss, but the feature does conversely improve the sound quality, delivering added attack and drive. At £27, you can’t really go wrong – you're only problem might be tracking a pair down, as they have been around for a while. To be honest, we can’t think of anything bad to say about these Goldring headphones. Originally released at £150, they're now available cheaper and definitely meet the 5-star criteria. Comfortable and superb at removing background noise, the NS-1000s sound powerful, clear and open. They look good, too. Well worth the money. Excellent noise-cancellation performance makes the Blackbox M10-RBs immediately impressive. The fact that minus background noise they deliver an absorbing musical experience with deep bass, clear vocals and natural highs, completes the package. Be sure to have the noise cancelling technology turned on, in fact, as otherwise they can sound a little muffled. In terms of design, they’re workmanlike but comfortable, and also come with accessories such as a handy carry bag. These JVC headpohones may have been around a while but they're still on the market and still capable of starting a party. A party for one, that is. A lively, upbeat sound migt be a bit too much for low quality files but provided your tracks are of a decent bitrate then these are a great bet. The noise-cancelling feature works well, too. These Klipsch headphones are now available at well under half the original price, making them superb value. The black/copper colour scheme may not be for everyone, but they have a plush feel and come with a case, selection of adapters and a three-button cable. They have outstanding noise-cancelling capability and a well-balanced, crisp and clean sound performance. Although more expensive rivals such as the PSB M4U2s have an advantage when it comes to musical engagement, the difference isn’t huge. They look good, they're long-wearing and they sound great, too. Especially at this price. The Bose QuietComfort 25 headphones finally knocked the QuietComfort 15s off their pedestal as best noise-cancelling headphones at our awards. An over-ear design, the noise-cancellation is excellent, while the sound is detailed, punchy and spacious. They come with a remote and microphone cable for Apple products, making hands free iPhone conversations possible, too, and they fold flat for convenient portability and storage. 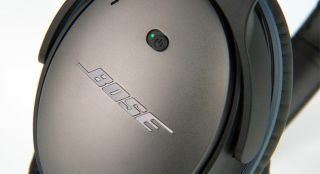 If you’re willing to pay the price, there is not much wrong with these at all – just a lot of things Bose does right. Apart from the fact they’re a little heavy, the Logitech UE-9000 are a quality pair of noise-cancelling headphones. They feel solid and look good, while the noise-cancelling functionality is equally satisfying. But there's more – the UE-9000s are also wireless. Bluetooth connectivity means they can be paired wirelessly to your phones, tablet or laptop, adding an extra dimension of flexibility. The sound is energetic, clear and perfectly tuned, and the closed back design helps even more to block external noise, too. A fine pair of headphones. These are PSB’s first headphones and they are brilliant. The Tri-Mode Active noise cancelling works effectively and the solid around-ear seal also works to block out a lot of outside racket. There is a facility to switch the noise cancelling on or off and an extra notch in the middle of that switch that activates the built in amplifier, but leaves the noise cancelling off. This not only creates exceptional sound quality but increases your portable player’s battery life, as it doesn’t have to work as hard to power the headphones. Sound has a considerable punch and is clear and well projected. We reckon the Bose Quiet Comfort 15s are probably more comfortable, compact and have better noise cancelling technology but that doesn’t mean these don’t provide an excellent listening experience.